Little Mac is the protagonist of the Punch-Out!! series. A human boxer from The Bronx, Little Mac trains under Doc Louis in order to become the world champion of the World Video Boxing Association (WVBA). Little Mac has also had various crossover encounters with Mario, Donkey Kong and other characters from the Mario franchise, some of which are via semi-regular cameos in the Punch-Out!! series itself. Little Mac fighting Donkey Kong in the Wii version of Punch-Out!! The original protagonist of the arcade Punch-Out!! and Super Punch-Out!! titles fought several fighters for the world championship, and was shown as a green-haired wireframe model during gameplay. The name "Little Mac" did not appear until Punch-Out!! for the NES (also known as Mike Tyson's Punch-Out!! ), which also introduced his manager and trainer, Doc Louis. In Super Punch-Out!! for the SNES, his design was replaced with an unnamed blond character. However, Punch-Out!! for the Wii retroactively considered all of the playable characters of the series as Little Mac. After fighting through all of his opponents once again, Mac gets tired of his fame and decides to go out in a blaze of glory. Dubbed "Mac's Last Stand", his condition for retiring and thus vacating the world championship is losing three times. In this game, Donkey Kong appears as a secret opponent, and his record is displayed as 0-0 (0 wins, 0 losses). In the latest title so far, Doc Louis's Punch-Out, he spars with Doc. Little Mac standing triumphantly while Mario counts out his opponent in WarioWare: Smooth Moves. WarioWare: Smooth Moves features a microgame called "Punch-Out!!" based on the game of the same name. In it, Mac knocks out his opponent (who changes depending on the difficulty), and the player, as Mario, has to count down the KO. Mac cheers if the count reaches ten in time. Little Mac dodging his opponent's attacks in WarioWare: D.I.Y. Showcase. In the microgame Punch-Out!! in WarioWare: D.I.Y. Showcase, Mac, controlled by the player, has to dodge his opponent's attacks. If all of the attacks are dodged, Mac knocks him out, while getting hit results in Mac getting knocked out. Little Mac punches on-stage and tosses off his pink sweatshirt. Little Mac appears in Super Smash Bros. Brawl as an Assist Trophy. Once he appears, he punches the enemies in rapid succession while moving quickly around the stage. After a while, he delivers one final blow that launches enemies far before disappearing. He can KO opponents as early as 35%. He is also invulnerable, although he can nevertheless be rendered useless if he falls off the stage. 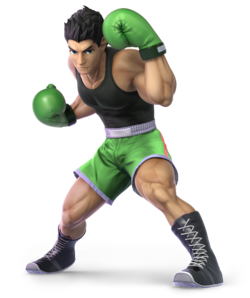 Little Mac appears as a new playable character in Super Smash Bros. for Nintendo 3DS and Super Smash Bros. for Wii U, having been revealed on February 13, 2014. 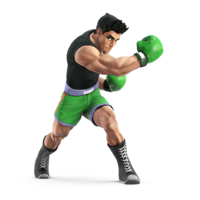 Unlike in Brawl, Little Mac sports a slightly modified version of his design from the Wii version of Punch-Out!! As expected for a boxer, Little Mac is a close-ranged fighter, with all but one of his moves being some variation of a punch. Although he is among the fastest characters in the game and his ground attacks are powerful, Little Mac is far weaker while in the air, as his attack power drastically decreases. Additionally, Mac's jumping and aerial attributes are very poor, with his air speed being his only aerial attribute that is at least average. To compound this, Little Mac is a lightweight, making it easy for fighters to send him flying. Little Mac uniquely has a Power Meter that charges whenever he inflicts and/or receives damage. When the meter is fully charged, it changes his neutral special attack to the powerful KO Uppercut. However, as with his other aerial attacks, KO Uppercut is drastically weaker when performed in the air. 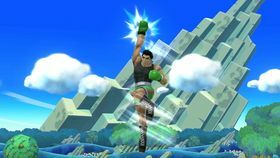 Little Mac's standard special is the Straight Lunge, which causes him to wind up his arm and then dash forward to perform a powerful cross. His side special is the Jolt Haymaker, which is a leaping overhand. His up special is the Rising Uppercut, in which he leaps into the air and first attacks with a corkscrewing uppercut and then finishes with a second uppercut with the opposite fist. His down special is the Slip Counter, in which he performs a full crouch stance and immediately counterattacks upon being hit by slipping inside and uppercutting the opponent. Little Mac's Final Smash transforms him into Giga Mac, a transformation that debuted in the Wii version of Punch-Out!! Giga Mac functions similarly to Giga Bowser: he boasts considerably stronger attack power and is immune to flinching. Little Mac has a number of alternate costumes that reference the Punch-Out!! series. Four are from the Wii version of Punch-Out! !, which are based on his World Video Boxing Association (WVBA) Champion attire in Title Defense Mode; his attire in Contender Mode during the World Circuit; his attire during the Major Circuit; and his attire when used by player 2 in Head-to-Head Mode. Two are from the NES version of Punch-Out! !, which are based on his signature pink hooded sweatsuit used during training sessions, and how he appears after he defeats any opposing boxers. Another is based on the blond protagonist in Super Punch-Out!!. Lastly, Little Mac also has "wireframe" variants of all his alternate costumes, based upon his appearance in the original arcade version of Punch-Out!! 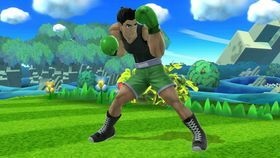 In addition to making his body consist of green wireframe, Little Mac's voice is replaced by 8-bit sound effects, while his boxing gloves and sweatsuit's colors are inverted to being green and pink, respectively. The overweight version of Little Mac from Captain Rainbow also appears as a trophy in Super Smash Bros. for Wii U. If Little Mac wins a match, Doc Louis appears alongside him on the results screen. When Little Mac uses a taunt, Doc Louis also appears to encourage him. 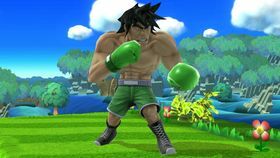 Little Mac returns as an unlockable playable character in Super Smash Bros. Ultimate, retaining many of his moves from the previous installment. His Final Smash is now Giga Mac Rush; while he still transforms into Giga Mac like in the previous installment, he can no longer move freely as him, instead attacking opponents on the spot with repeated punches. The Straight Lunge is Little Mac's standard special move. When used, Little Mac charges up a punch; during that time, he gains knockback resistance against weaker attacks. By pressing the button again, Little Mac charges forward and hits any opponents in his path with a straight punch. The more it is charged, the farther he travels, but the attack's power does not increase unless it's fully charged. 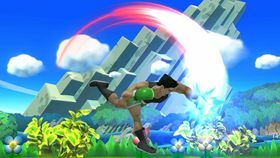 A fully charged Straight Lunge causes Little Mac to cool down for a longer period, but it also delivers a good amount of damage and knockback upon landing on an opponent. Whenever Giga Mac uses Straight Lunge, it charges to full power at a much faster rate than normal. If used in the air, Straight Lunge does not offer any horizontal movement, unless it is fully charged. Additionally, its attack power is considerably weaker in the air. When Little Mac's Power Meter is full, the Straight Lunge is replaced with a one-use move, called the KO Uppercut; Little Mac delivers an unblockable uppercut in front of himself. Contrary to its name, however, the KO Uppercut isn't a one-hit KO move, as it cannot normally KO fighters at 0% damage, but whenever the attack hits any opponents, they are sent flying a great distance. The aerial version of the attack is much weaker in power. Also, this move's ending lag is long, which can leave Little Mac vulnerable to counterattacks if the attack misses. In Super Smash Bros. Ultimate, Little Mac performs a jump with the KO Uppercut. In Super Smash Bros. for Nintendo 3DS and Super Smash Bros. for Wii U, the two variations for this move are Flaming Straight Lunge and Stunning Straight Lunge. Flaming Straight Lunge deals fire damage, charges more quickly, and can hit multiple times, but deals less damage. Stunning Straight Lunge stuns opponents when fully charged, and travels a farther distance, but it doesn't offer any knockback resistance while charging. The Straight Lunge is the move Kirby copies after Inhaling Little Mac, but he cannot use the KO Uppercut as he does not gain a Power Meter. The Jolt Haymaker is Little Mac's side special move. When it is used, Little Mac leaps forward and delivers a downward-swinging punch. The player can press the special button again while Little Mac is in the air to punch early. Little Mac cannot be controlled after using this move, and if he remains in the air after using it, he is left in a helpless state until he lands. The first variation of this move is the Grounding Blow, in which Little Mac leaps up higher and delivers a punch directly downward; this move can bury opponents, and has meteor smash abilities if sweetspotted. However, its horizontal movement is worse than that of the default Jolt Haymaker, making it a lot less effective for recovery. The second custom variant is Guard Breaker, which is slower, and the jump does not have as much horizontal distance, but it is more powerful, and unblockable. Pressing the special move button again does not make the move execute quicker. Interestingly, this move has an inconvenient property, where it doesn't offer Little Mac any horizontal movement if used immediately out of knockback. Rising Uppercut is Little Mac's up special move. Little Mac leaps up into the air, spinning around and punching multiple times, dealing multiple hits to any opponents nearby, and ending with a more powerful punch to send them flying. This move hardly offers any horizontal movement, however, and its vertical travel distance is only about as good as an average jump if it's used in the air. Because of those flaws, Rising Uppercut is often considered to be the worst recovery move in the game. In Super Smash Bros. for Nintendo 3DS and Super Smash Bros. for Wii U, the Rising Uppercut's first custom variant is Tornado Uppercut, which only deals one hit to opponents, and is weaker, but has greater vertical distance. The second is Rising Smash, which deals one blow to send opponents into the air, then a second more powerful punch the send them flying; the move does not have as much vertical distance, however. Slip Counter is Little Mac's down special move. When used, Little Mac braces himself, and if he is hit while using the move, he then counters with an uppercut, nullifying the original attack and dealing increased damage. The move's two custom variants in Super Smash Bros. for Nintendo 3DS and Super Smash Bros. for Wii U are Compact Counter and Dash Counter. 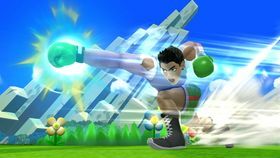 Compact Counter reduces the knockback, but gives a reduced start-up time for the move and allows for quick combos after the attack; Dash Counter lets Little Mac dash forward after countering, though he cannot attack while doing so, which can be used as a means of recovering from the air. Giga Mac is a giant, monstrous version of Little Mac into whom he transforms for his Final Smash in Super Smash Bros. for Nintendo 3DS / Wii U, first appearing in the multiplayer mode in Punch-Out!! for the Wii. Like Giga Bowser, Giga Mac's attacks are more powerful, with most of them dealing 2x more damage than Little Mac's attacks, and they also have greater range, with some of his attacks being able to potentially make one-hit KOs when fully charged. The Straight Lunge also charges at a much faster rate. Along with the power boost, Giga Mac also moves faster, and does not flinch from taking damage. However, Giga Mac does not have a Power Meter, and his aerial attacks are still weak when compared to his ground attacks. Additionally, the length of time spent as Giga Mac is shortened if he takes damage. Giga Mac is unaffected by Metal Boxes, as he never gains a metallic appearance, even in a Metal Special Smash. He is also unaffected by Super Mushrooms, Poison Mushrooms, and Lightning, but his size can be altered by playing a Giant or Tiny Special Smash. Giga Mac Rush is Little Mac's Final Smash in Super Smash Bros. Ultimate, replacing his previous transformation Final Smash in Super Smash Bros. for Nintendo 3DS / Wii U. When the Final Smash is activated, Little Mac transforms into Giga Mac and stuns any opponents in front of him with an uppercut. He then throws a flurry of punches at the stunned opponents (similar to Donkey Kong's Final Smash), culminating with another uppercut that launches them upwards. 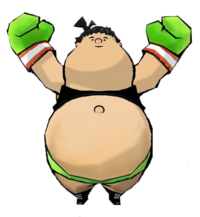 In Captain Rainbow, Little Mac has been out of work for some time and has become largely obese due to the events of the game. The game's protagonist, Nick, helps him get back into shape. This appearance also appears as a trophy in Super Smash Bros. for Wii U. 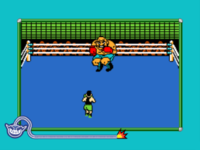 In NES Remix 2, Little Mac makes an appearance in several mini-games based on the original Punch-Out!! game. They all involve Mac beating various opponents with different restrictions, like knocking out Von Kaiser with an uppercut, blocking Great Tiger's attacks while the screen fades out, or beating a powerful Glass Joe. Little Mac makes an appearance as a Mystery Mushroom costume in Super Mario Maker, which can be unlocked by scanning his amiibo or randomly after completing the 100 Mario Challenge on Expert or higher. Upon transforming into him, the bell from the original Punch-Out!! can be heard. The theme that plays after losing a match and the victory theme also play when the player loses a life and clears the course, respectively. NES Punch-Out!! A lightweight scrapper from the Bronx. After meeting with a former boxing great named Doc Louis who fell from glory, Mac takes Doc on as his coach, and together the pair try for the championship belt in the WVBA. Little Mac works his way up the ranks of the WVBA, taking out foes several times his size. By landing multiple blows, Little Mac gains a "☆" uppercut. Wii Punch-Out!! (05/2009) This little boxer from the Punch-Out!! series makes up in heart what he lacks in height. He wasn't afraid to take on the boxing champs, and he's not afraid of the Nintendo stars. In Smash Bros., he packs a serious punch. When his KO Meter fills up, wade in and trigger a devastating uppercut. The little guy from Punch-Out!! has come a long way since his humble beginnings fighting the almost literal boxing giants. Above his damage display, you'll notice he has a little meter that fills up as he fights. When it's full, you'll see a flashing "KO" there. That means you can unleash a devastating uppercut! Wii Punch-Out!! (05/2009) No matter his opponent, Little Mac always puts his best fist forward. He enters a charge state before unleashing his Straight Lunge special and can unleash it while charging by pressing the button again. He won't flinch while charging. At max charge, the launching power of this move is scary! Little Mac always puts his best fist forward, especially when you use Straight Lunge! You start by charging, then unleash the punch whenever you press the button again. Charge it to the max and its launching power is formidable! Also, attacks won't make you flinch while you're charging or once you've fully charged the move. N/A This Final Smash turns Little Mac into a hulking monster of a man. In Punch-Out!! for Wii, Little Mac could take this form by building up the gauge with some well-timed blows. In this game, it seriously powers up his attacks and makes him even faster. He'll completely dominate on the ground, but air battles are outside his weight class. N/A Wii Captain Rainbow (Japan) Wait. Is...is that Little Mac from Punch-Out!!? We'd heard he went to Mimin Island to train to become a world champion again, but it looks like he went a few too many rounds in the ring with those island mangoes. If you don't help him get back in shape, we might need to come up with a new name for him... Wait a second. This is Little Mac? What happened to the "Little" part?! The star of Punch-Out!! clearly hasn't been keeping up with his training if he's ended up like this! Now that he's moved to Mimin Island, though, all hope is not lost. It's said wishes come true there - hopefully, that includes Mac's wish to get back to his former glory. Pit: This guy looks ready to fight! Viridi: That's Little Mac. As a boxer, fighting is sort of his thing. No one can match his strength on the ground, but in an aerial battle, he's helpless. Palutena: So you want to get him in the air, and keep him from landing. Viridi: He has a power meter that, once full, lets him unleash a lethal attack. Viridi: Maybe that's why he's LITTLE Mac. But even with his small stature, he's triumphed over many heavyweight boxers. Pretty impressive for a puny HUMAN. Pit: Bring it on! The stronger the opponent, the more interesting the fight! Pit: Uh, I can keep using my weapons, right? 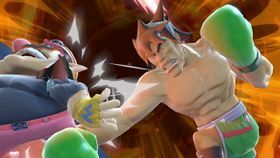 Xiǎo Màikè Transliteration of "Little Mac"
Literal translation of "Little Mac"
This page was last edited on March 16, 2019, at 14:54.